My commitment with the Sandy Quilt Block project has finally come to an end. This has been one very long road. When I signed up to assemble and finish four quilts for the Hurricane Sandy Quilt Project I think I must have been a tad bit nuts. Originally I agreed to stitch together 20 quilt blocks. That seemed like an easily attainable task. Then for some unknown reason I found myself registering to put together first two then four quilts. What was I thinking?? I didn’t fully understand the impact of my commitment until I was well into the challenge. Foolishly I had thought I could conquer the entire endeavor by the end of December. Unfortunately December came and went and I still had not received all of the blocks. As January rolled on I began to panic. How in the world was I to finish these quilts if I didn’t receive the necessary shipments. Out of desperation I enlisted the assistance of my leader at Quilting Gallery. With her gentle prodding the last package finally arrived. Now don’t think for one minute the project was a total drag. 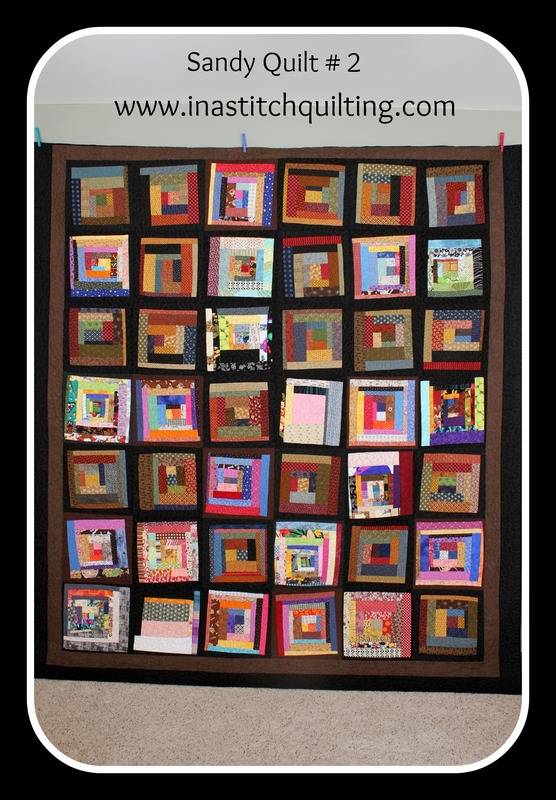 I found great joy in the creation of the four quilts. Watching them develop from a stack of donated quilt squares to a finished masterpiece was truly a pleasure. 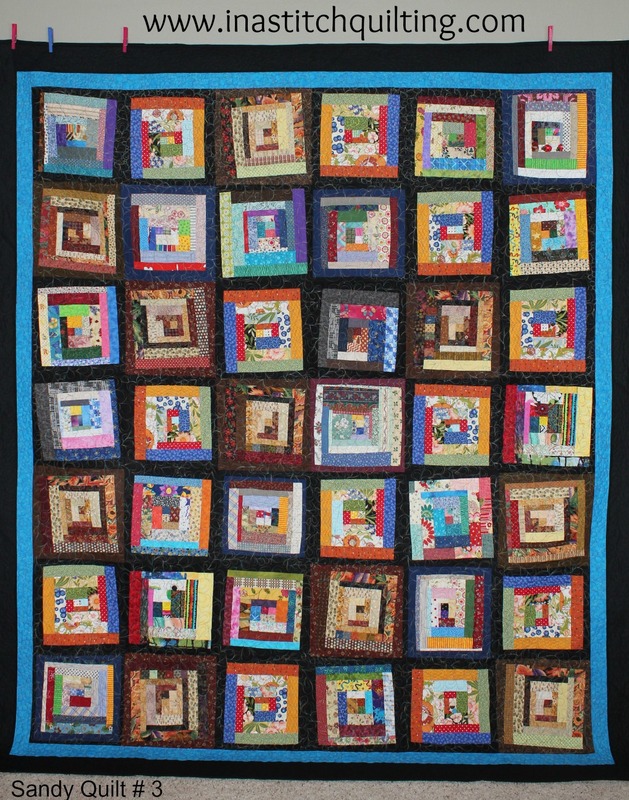 The most laborious task was the pressing, trimming and refinement of the individual squares. Because the quilt blocks were the foundation and focus of the quilt I made certain each and every one received as much attention as needed. Once each block met with my approval the painting process began. By mentioning the word painting you’ve probably filled your head with visions of paint cans and brushes. I’m sorry if you feel misled. Instead of painting perhaps I should have said design. These quilt squares came from all over the United States and Canada. The variety of origins as well as the smorgasbord of fabrics made each one unique. No two were identical. None of them arrived with a pre-assigned placement attached to their border. Somehow each one had to be analyzed in order for it to be placed in its optimal location. This is what I call the design phase and/or the painting process. My living room floor became my canvas and the quilt squares were my paint. One by one each square was removed from the stack designated for each quilt. I found this process to be invigorating. Carefully each one was moved about until a harmonious picture was achieved. Once the placement process was complete I systematically stacked the blocks into rows then carefully relocated them from my living room floor to my sewing center. There I stitched together the individual squares forming first the rows and then the rows into a quilt top. Each seam was carefully pressed making sure they aligned just so. Paying particular attention to this step helped to make the free-motion quilting more successful. As the final details were accomplished the fruit of my labors was evidenced by the amazing display of color shining back at me. I pondered how wonderful it would have been for the women that created the magnificent quilt blocks to be present to view the unveiling. 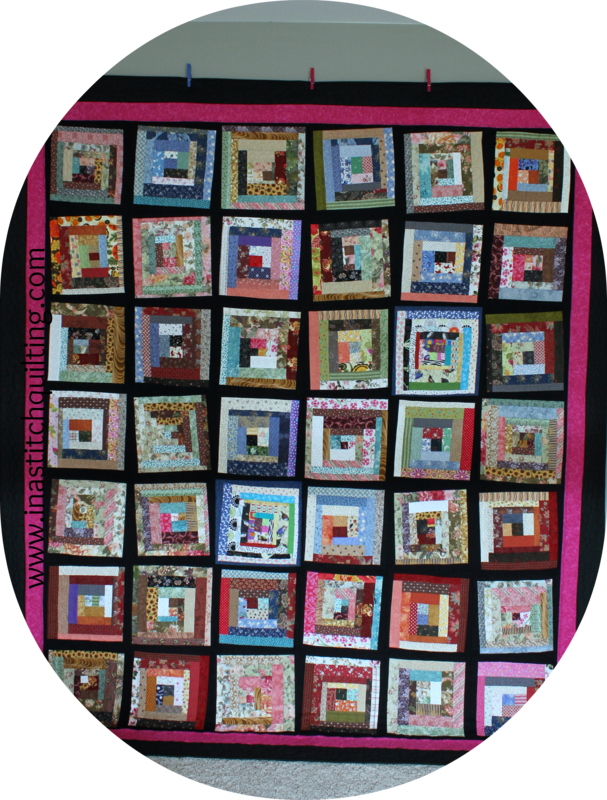 With the squares assembled into quilt tops two borders were added. The first was a color chosen based upon the overall theme of the squares. Black was always used for the second border. Just as with the individual squares the black outermost border provided a unifying frame. All four quilts were given unique fabrics for their backings. Quilt # 1 was pieced together with fabrics from my own stash. Quilt # 2 had a backing donated by one of the quilt block participants. Quilts # 3 & # 4 also came from my inventory. Both had backings fashioned from flannel. Just as with the quilt squares and backings the quilting stitches used for all four were different. Quilt # 1 had an all over loopy design. Quilt # 2 was filled with the meandering pattern. Quilt # 3 had three different patterns. The outer most border was saturated with a meandering stitch. The inner border was adorned with the pebble stitch and the body of the quilt was painted with a paisley stitch. Last but not least Quilt # 4 had its own distinct stitching design. 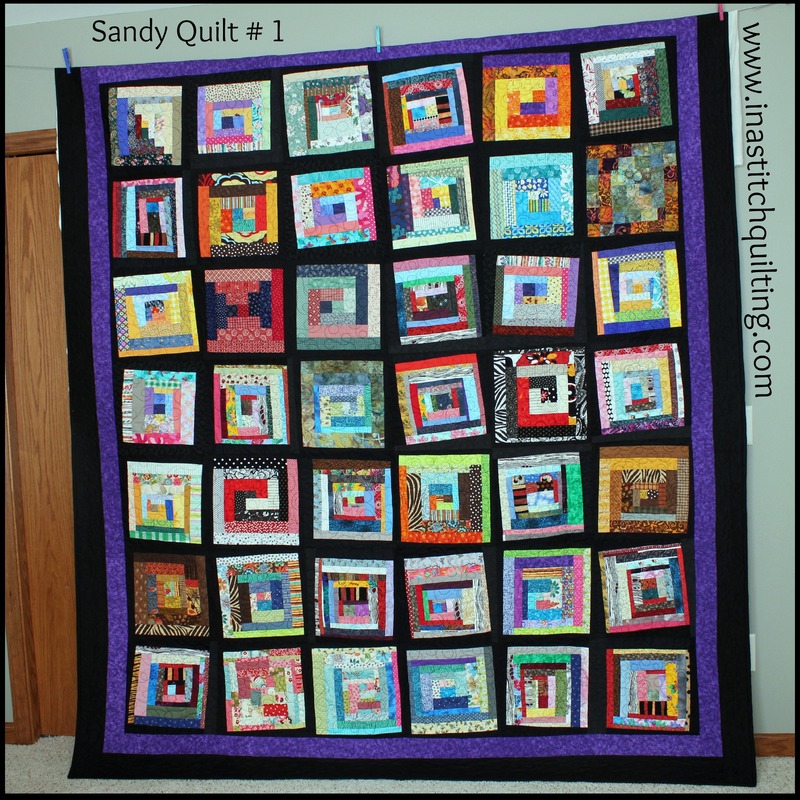 The outside border of Quilt # 4 was filled with pebbles. The inner border had a continuous row of swirls and the body was filled with a random swirl pattern. Applying the quilting stitches to each quilt was my most favorite part. I take great joy and pride in my work. This segment was solely my responsibility. At first I was not at all in a hurry to complete it. The further I got though the harder it was to resist the urge to finish. The desire to see the completed product grew stronger and stronger. It’s like eating one of your favorite chocolates. At first you dive in, take a bite, and savor each morsel. Before long you realize it’s almost gone. You hesitate as if to slow the progression. Eventually that overpowering craving takes over and you give in to the urge. When the final stitch was applied to Quilt # 4’s binding I was overcome with a bittersweet feeling. The goal I had sought after since November had finally arrived. I had pushed myself to achieve it as quickly as possible. Each passing day meant one more day a recipient would wait for its arrival. Often we think of the destination as the journey when in all reality the journey is the destination. It’s the experiences along the way that add up to make the event. This challenge has absorbed every ounce of energy I could muster. At times I found myself close to exhaustion. Being careful not to lose sight of the journey I kept reminding myself to enjoy every moment, don’t be in a hurry, absorb as much as possible and savor every minute. Aside from the joy I received from accomplishing my task the participants blessed me with numerous cards and well wishes, along with gifts of fabric and even a donation of money. These rewards were greatly appreciated. Over the life of this project I took delivery of 148 quilt blocks. From those squares I assembled four quilts with an average size of 96″ x 85″. I consumed no less than eight yards of black fabric to create the outer borders and bindings. I lost track of the number of bobbins I filled and the amount of thread I used. Countless hours sewing, pressing, quilting and hand stitching were accumulated to produce, what I consider to be four glorious quilts. All four quilts have been shipped to New Jersey. Two of them were due to arrive on March 21, 2013. What has happened to those quilts since leaving my arms I can only imagine. A part of me went with each one. My only hope is that the deserving recipients will take great joy in receiving them. Those four quilts were destined to bring comfort and warmth. As we part company I would like to share with you one last look at all four quilts. I hope you have enjoyed following me on this adventure. It’s been one that I won’t soon forget. I’m linking up with A Lovely Year of Finishes. Please take some time to visit Sew Bittersweet to share in the other participants success. < 100 Degrees and Counting? I think you did a wonderful job of putting all those disparate colors and fabrics together. Each is one I’d personally love to own, so I know the recipients will feel the same. I’m sure it will bring a measure of comfort to them. You did a wonderful job! You and all those that donated the squares. The quilts are beautiful. You did a wonderful job on all four quilts. I hope that the family that receives these really do appreciate them. That was a lot time and work went into those. Thanks! I couldn’t have done it without the combined efforts of all the participants. I so glad you stopped by! Come see me again. I love seeing them all in one place again for one last time. Congratulations on the finish of such a huge undertaking! Reading your words “one last time” brings a lump in my throat and tears to my eyes. They became such a big part of my life that it was almost like giving away a part of me. They were like family. Indeed is is really cool to see them all in one place. So wonderful to have the pictures. Great job, what a lot of work! My blocks are in quilt # 3. I got a lot of satisfaction out of being part of this journey. It indeed was a journey! How cool it was to join forces with you and everyone else that participated. Thank you so much for your assistance! Together we made a great team! Cindy, they are all beautiful. Four very lucky families will treasure the quilts for years to come. Cindy, I can certainly tell you poured your heart into this journey. They are all so wonderful and I’m sure the recipients will undeniably treasure them Great job! They all turned out lovely. So glad I could be a part of it all. Mine are in quilt #4. Thanks for all your hard work and dedication to complete them.